Breathe is off the long arm and has her binding sewn on the front. I will be spending some time stitching it down by hand and mending in the ends - there are a lot of ends from where threads broke or bobbins ran out. More organized folks mend them in as they go. Right now she feels fairly cardboardy from all that thread on the Essex linen borders, but I am fairly sure that a wash will fix that. I did finally finish my spiderweb blocks for Clara for May in the Modern Stitching Bee. I try not to get behind on bee blocks, but I have to say that I really don't like making these blocks. 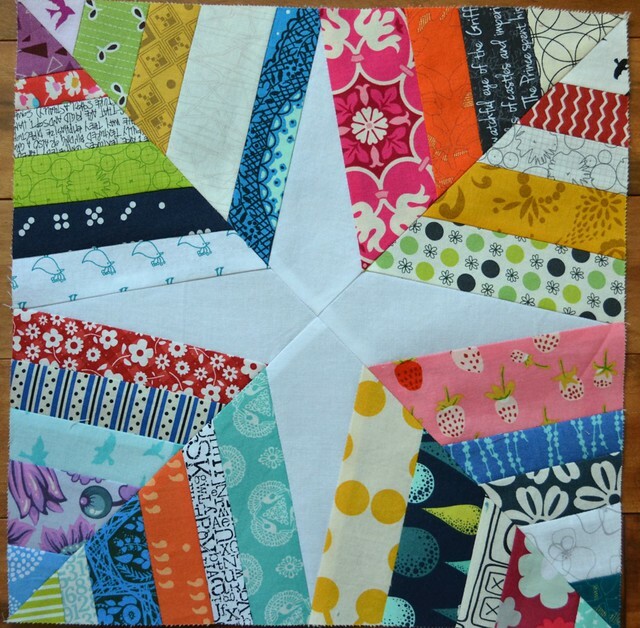 The spiderweb quilts are amazing but I cannot imagine making a whole quilt of the blocks myself, so a perfect bee block. Some thoughts if you were making a bunch. Get your strips sorted and cut to the right widths before you start. Piecing them into strip sets before one attached the first strip to the centre point would also make the process more friendly and faster too. By the way, have you been to Flickr lately? They have done another upgrade and I like it much better than the just past version. I have to say that I love flickr, and I am glad to see it becoming a little more friendly to use again too. These Bonnie Hunter's Boxy Stars are for Celeste in Always Bee Learning. 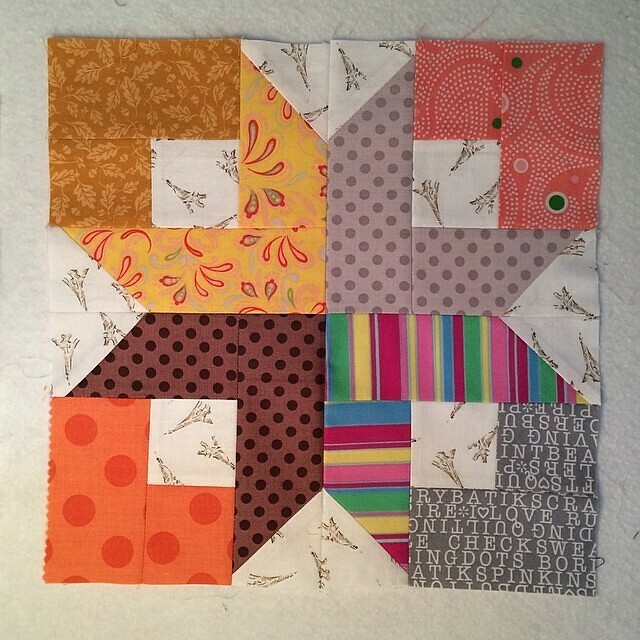 She sent the fabrics already cut to size, so the blocks were a breeze to put together. Getting to the mail has been more difficult and it is on my list to mail both these sets of blocks off today. My other Boxy Star. This is one of those blocks that I would like to play more with one day. 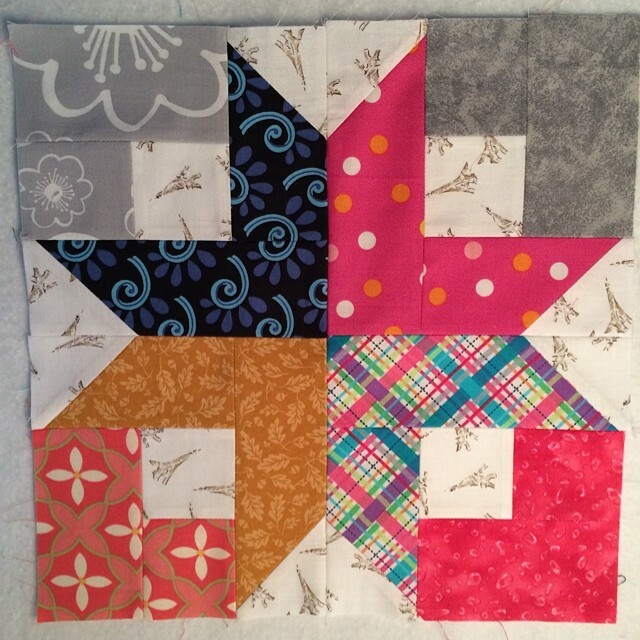 I still have Anneliese's June bee blocks to get done in the next few days - they are each composed of 36 HSTs with my own fabrics so I am back to the scrap bins again. I woke up to read the wonderful things that the Pink Chalk Fabrics folks wrote about my pattern on the Pink Chalk blog and then again here in their newsletter today. Thank you Kathy and Diana and all the Pink Chalk folks, you made my day! You can now purchase my Canvas pattern at Pink Chalk Fabrics too. So now I want to finish these funky Canvas pillows. With Breathe off the long arm, I can put these pillows on it tonight - maybe its time for a version of Canvas with matchstick quilting. There are a few things coming up here. It is the end of Q2 in the FAL this month, so I am checking my list to see if there is another finish I can manage in time. 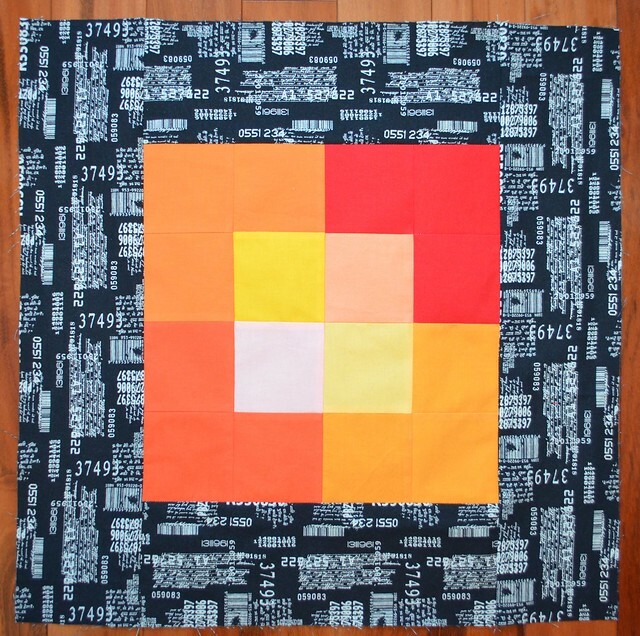 And I have to decide which quilt to enter for consideration for the Modern Quilt Showcase for the International Quilt Festival show in Houston as entries close tomorrow and clearly Breathe will not be finished in time. Jess and I are, for sure, running our next instalment of Decipher Your Quilt next Thursday and I need to get my photos of how to make circles finished for that. But for now, I am off to my day job. Which is a good thing, as I might have ordered yards and yards of Brambleberry Ridge - Violet Craft's new fabric line - last night. Breathe is lovely - can't wait to see finished photos. And congrats for all the hoopla about your Canvas pattern - that's really cool! Great bee blocks and Breathe is beautiful, looking forward to seeing it finished. Beautiful Breathe and the pillows look great. Love the color. Gosh I never counted the HST and reading about it just scared me! It looks fabulous Leanne. You have been busy with your bee blocks too. Lots of pretties there. Lovely work Leanne! I especially love the cushion with the black text border - it really makes those hot colours in the centre pop! I love how those prints make the solids leap out at you on the Canvas cushions! I am also one of those people that sorts out the broken threads, etc at the end (and I will have a lot of those on the current project believe me). Thanks for the heads up about Flickr- I hadn't noticed any changes yesterday so maybe it's filtering through. Will keep my eye out. 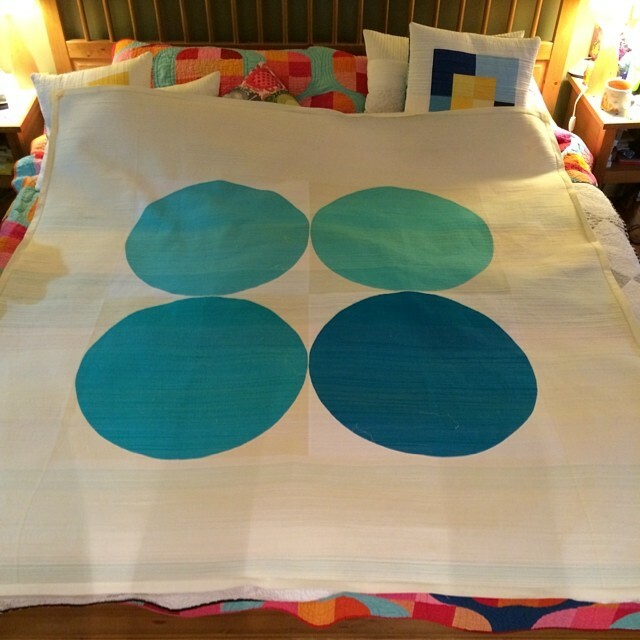 Love your Breathe quilt!! It's fantastic. 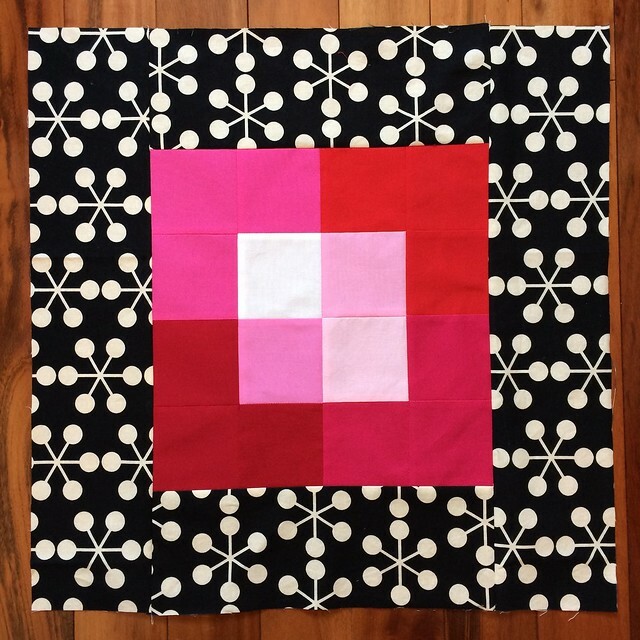 I want to buy a long arm just to do match stick quilting. I have not had good success on my domestic machine. I love how yours is turning out! Breathe is fabulous!!! I also love your bee blocks but can see that those spider web blocks would be quite time-consuming (and tiring!) to make. It's lovely to see your pattern doing so well - long may it continue! P.S. Yes, for once they've managed to improve Flickr rather than, yet again, making it worse! I love your Bee blocks you've been making. 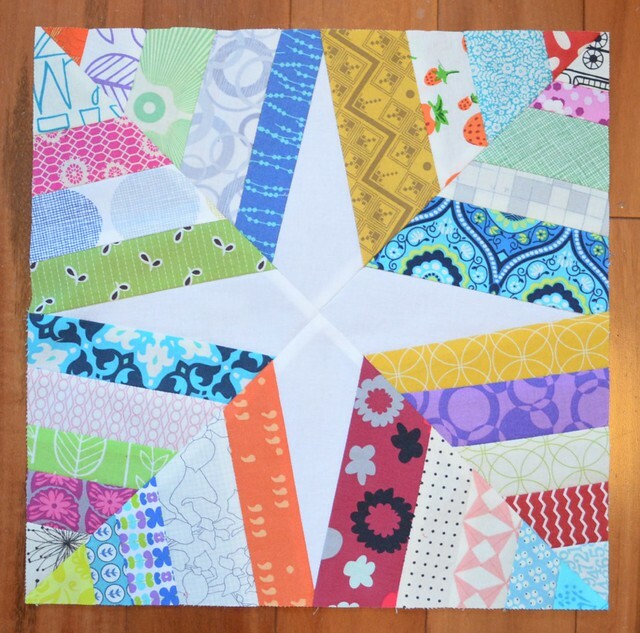 I think the BH Boxy Stars is a fav though I do love the Spiderweb block too. Your quilt is a beauty, too. Carry on! Hee Hee! so excited for your Canvas Pattern debut! And those oranges!! Yum! Sounds like you're having a blast, YAY! Wow. Your quilting makes me catch my breath in awe. Congrats on your pattern debut! I'm delighting in seeing versions popping up in blogland. Such a great design, Leanne.